I am a Gen Xer. Sometimes in the early mornings in my daily shower I get reflective about things. This morning I found my mind wandering to the subject of my life, my generation and all the incredible things that have happened in just my short time on this planet. Gen X is the generation born after the Western post–World War II baby boom describing a generational change from the Baby Boomers. In a 2012 article for the Joint Center for Housing Studies of Harvard University, George Masnick wrote that the “Census counted 82.1 million” Gen Xers in the U.S. The Harvard Center uses 1965 to 1984 to define Gen X.
Gen Xers are often called the MTV Generation. They experienced the emergence of music videos, new wave music, electronic music, synthpop, glam rock, heavy metal and the spin-off glam metal, punk rock and the spin-off pop punk, alternative rock, grunge, and hip hop. Compared with previous generations, Generation X represents a more apparently heterogeneous generation, openly acknowledging and embracing social diversity in terms of such characteristics as race, class, religion, ethnicity, culture, language, gender identity, and sexual orientation. THE EVOLUTION OF PHONE TECH – In my life I’ve talked on a roatary dial phone, punched keys on a touch tone phone, owned early cell phones (motorola bag phone anyone?) late 90’s motorola flip phones, Palm Treo, Blackberry, to my current iPhone. I’ve seen the invent of cell phone technology, text messaging and smart phones..all in less than 40 years. VIDEO GAMES – So here’s the short list of consoles I have personally owned. Atari 2600, NES, SNES, N64, Wii, Xbox, Xbox360, XboxOne. Thats not to mention all the ones I haven’t owned, Playstation 1, 2 3 and 4, Sega Genesis, Turbografix 16, Atari Jaguar, and a whole bunch of others I’m not mentioning. That’s not to mention the handheld consoles too, gameboy, gamegear, PSP, Nintendo DS, DSI, 3DS. Graphics from simple squares to 8 bit Super Mario bouncing across my screen for hours on end to the hi res 3D graphics of the current consoles. I also remember dropping quarters into arcade games as a kid, One game I can remember loving was Rampage. Anyone else remember this one? STAR WARS – There has literally not been a time that I can remember in my entire life that Star Wars didn’t exist. I have always had a healthy obsession with this (see my other blog posts, you’ll figure it out quickly) This movie changed the way movies are made and set the bar for visual effects and sound design. Even today, ILM and Skywalker Sound (If you didn’t know are the result of the direct success of George Lucas and the Star Wars franchise)are the Hollywood standard for sound and CGI Effects in movies. THE INTERNET – Could you imagine what the world would be like today if the internet didn’t exist. I lived in that world..up until highschool. I still remember a bunch of us being herded into the school library and shown this wonderful thing called the internet. Back then it was all text based and dialup. I went to a rural highschool so we had to dial into the most local University to get access to it. After highschool I went to college and was introduced to the world wide web and Netscape Navigator. After that it continued to evolve…websites for everything, social networking, blogging, twitter, Facebook, the list goes on and on. Take one beloved pet tortoise, add a couple of wheels usually reserved for office furniture and presto..you got the worlds first bionic turtle (NANANANANANA) When I read this story I was in hysterics. The team, however, had no choice but to amputate the tortoise’s entire leg after determining the infection posed a risk to the tortoise’s entire well-being. 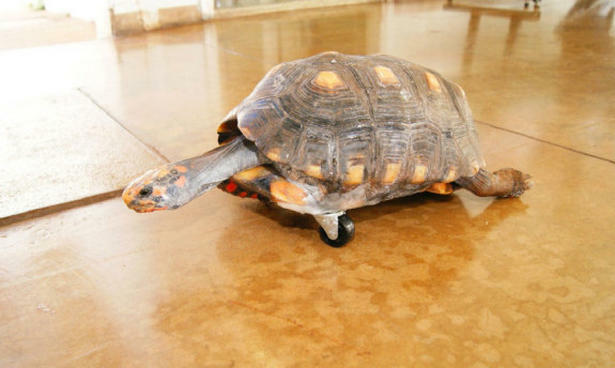 But while animals such as dogs and cats can manage on three legs, things aren’t as easy for a tortoise with its heavy shell and sluggish movement. They say truth is stranger than fiction..and this is definitely the case here. I wonder what kind of life span this turtle can expect now he’s on wheels? I guess it really depends how closely he follows his maintenance schedule. 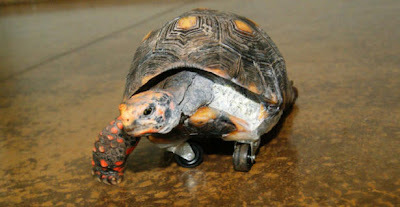 Make sure his bearings are well lubricated, wheels rotated…do they even make a hoist for a turtle? What’s next…a bionic dog that can dry-hump your leg at 60mph?, a bird with a 100 decibel squawk?… a cat that can ignore you faster than a speeding bullet? THE FUTURE IN PET PROSTHESES HAS ARRIVED!